is the energy you give the energy you get back?” – “Do the drummers make the dancers dance, or do the dancers make the drummers drum ? Yes! …the team pulse is a living, breathing beat, set by the relationship of the rhythmical alchemy created by everybody participating. 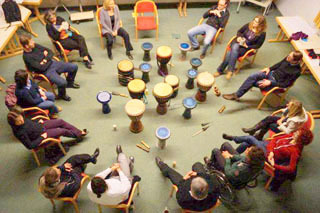 This organic beat varies with the energy and emotional dynamics of the circle, and can only be facilitated and not directed not forced or imposed. In klar strukturierten musikalischen Führungsaufgaben bietet musikalische Interventionen als analoges Lernfeld einen offenen und freien Raum, um neue Strategien zu allen oben angeführten Themen zu explorieren – das sofortige Feedback der MitspielerInnen wird durch deren Groove hör- und spürbar. leaders are confronted with basic fears, that can be barriers to their musical enjoyment and their professional success: fear of performance, fear of losing the beat, fear of being put on the spot, fear of looking stupid.